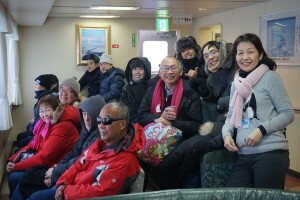 The 29 of us taking the Hawaiian Airlines flight from Honolulu to Chitose experienced an extra-long trip. Even though our flight was smooth and almost 1 hour ahead of schedule, it ended up being diverted to Narita due to a last minute runway closure because of the blizzard. 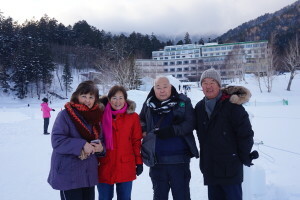 The captain tried to fly back to Chitose on the same night after refueling, but they were unable to get a crew, so we ended up staying overnight at the Nikko Narita Airport Hotel. 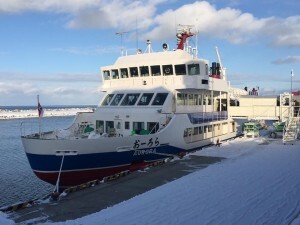 We took a domestic flight from Haneda to Chitose in order to catch up with the travel itinerary. 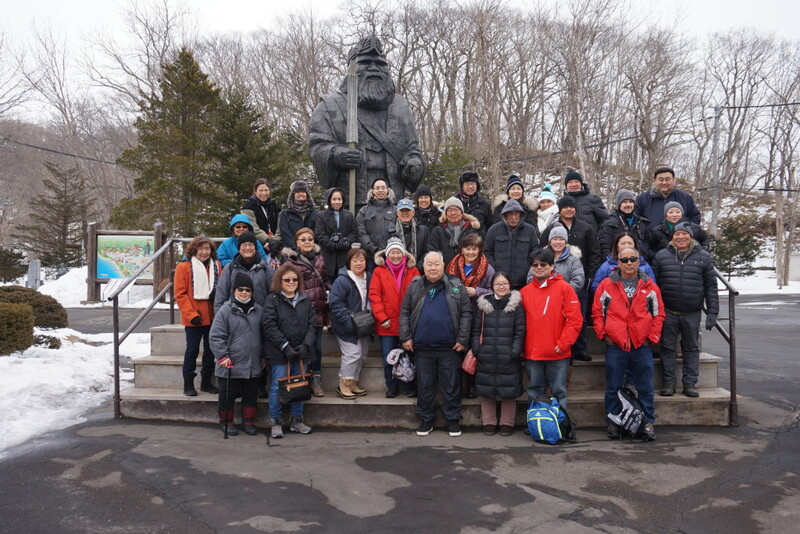 Thank you to our bus driver, Mr. Takenaka, who drove so safely on the icy road all the way to Sounkyo Gorge. 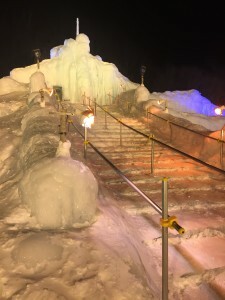 The highway was partially closed, the speed limit was reduced, and the road was slippery… there were many challenging factors that led to an over 4 hour trip, but Mr. Takenaka drove us as cautiously and quickly as possible to our hotel. 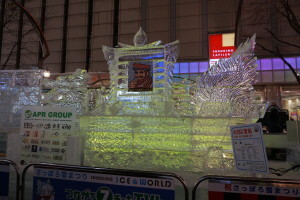 We were able to enjoy the Sounkyo Ice Festival after dinner. 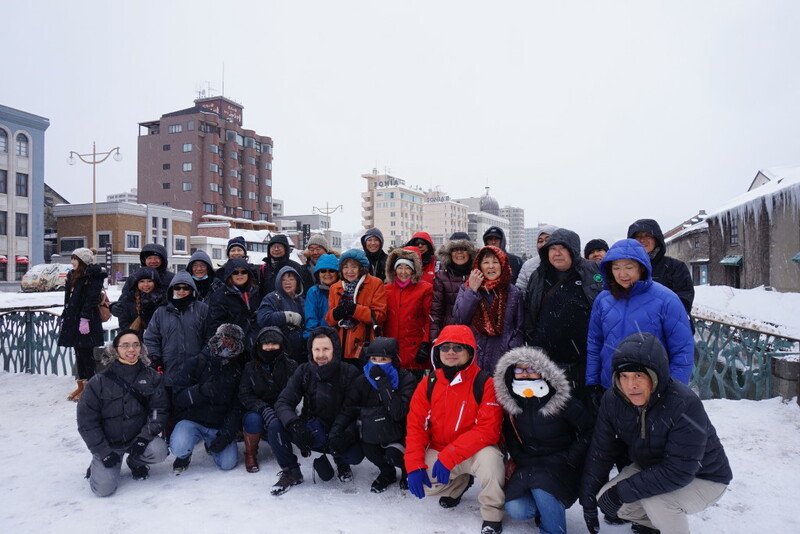 It was super cold, but we all enjoyed our first snow festival of this trip! Know what the best part was? 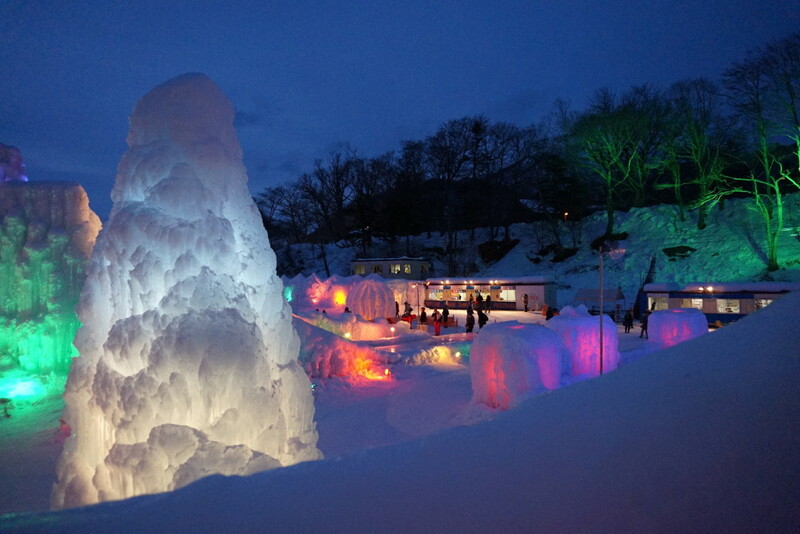 Going to the Onsen (hot spring) afterwards! 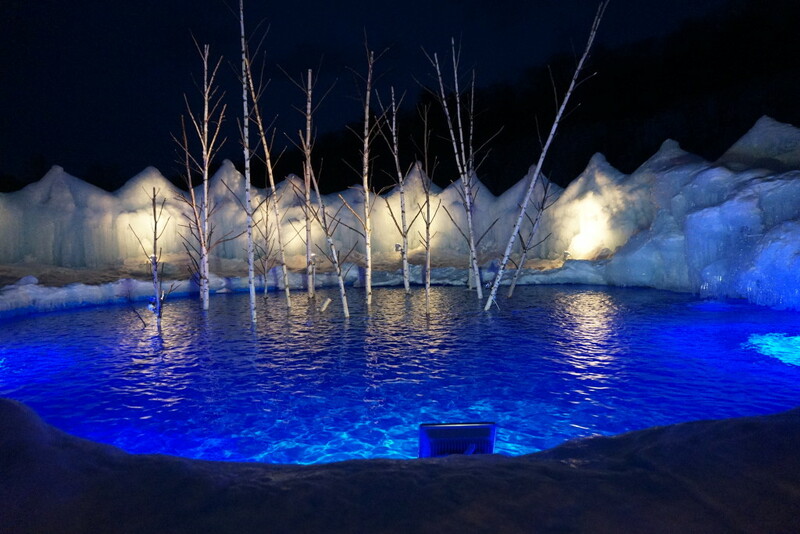 They had a Rotenburo (an open air outdoor Onsen) and it was extra nice after the long trip! 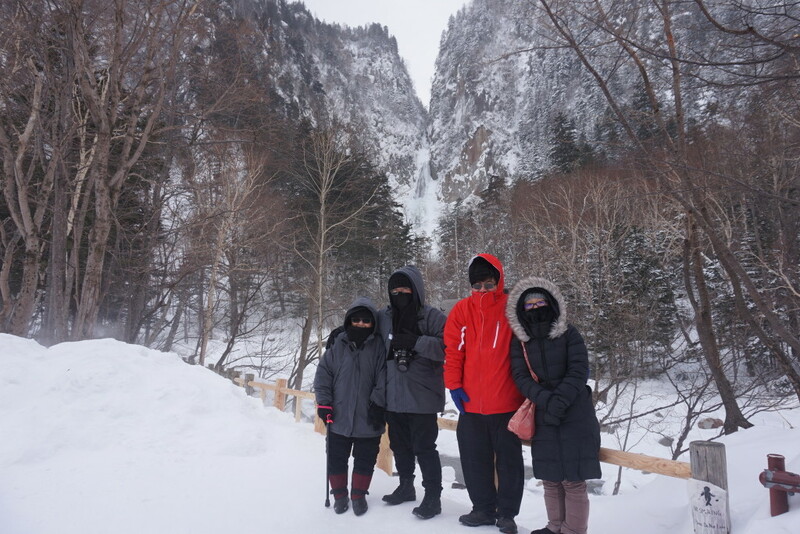 We took some pictures at the Ginga Ryusei Waterfalls. There are two waterfalls: one is elegant and beautiful representing the wife, the other is more masculine representing the husband. 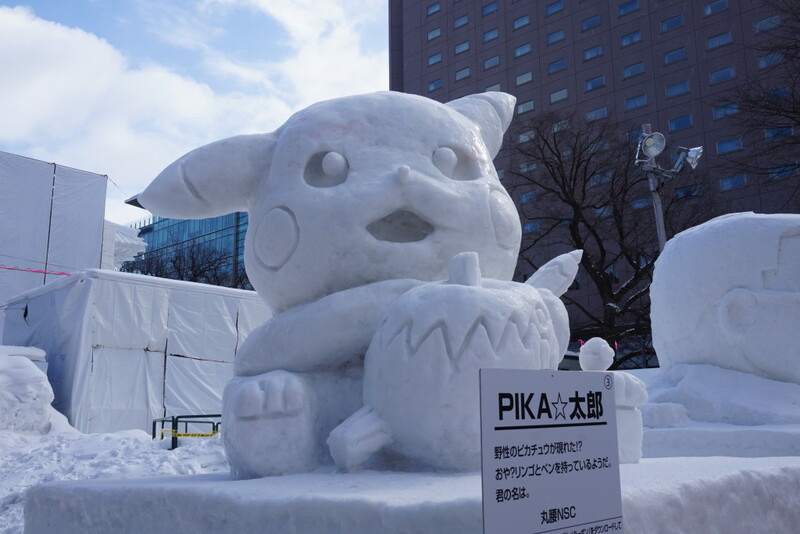 We couldn’t really tell the difference since they were both frozen! 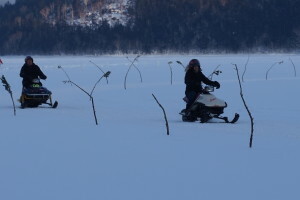 But it was great to spend time in the mountains. 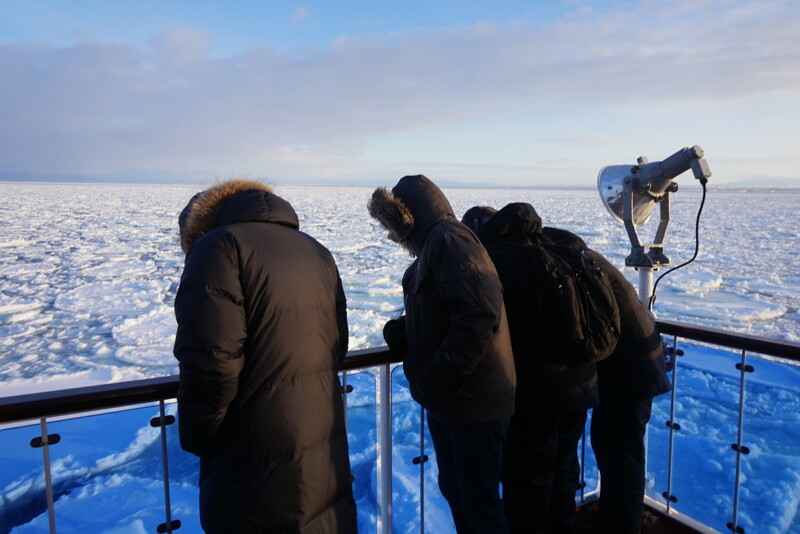 Our next stop was the Ice Breaker Cruise out on the Sea of Okhotsk. 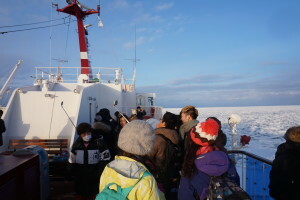 Their was an enjoyable one hour cruise on the Ice Breaking ship, the Aurora-go. 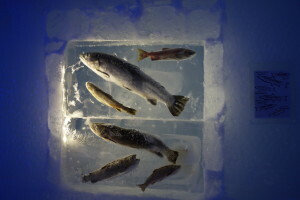 Some of us saw eagles on the drift ice. 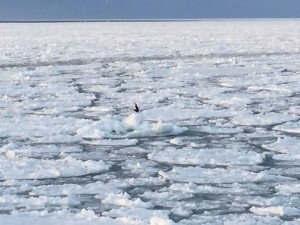 Sometimes there are Seals but we didn’t encounter today. 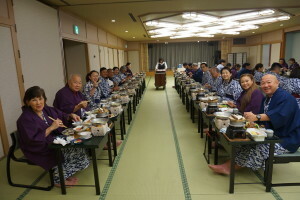 Our dinner at the hotel was Japanese set menu served in Kaiseki Style. 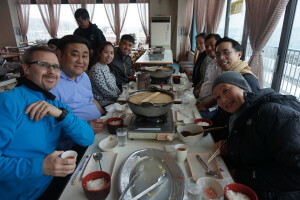 Nabe (hot pot), Kamamesi (flavored rice cooked in cast iron pot on table top), Sashimi, tempura, and many more dishes were continuously kept coming! Wow! 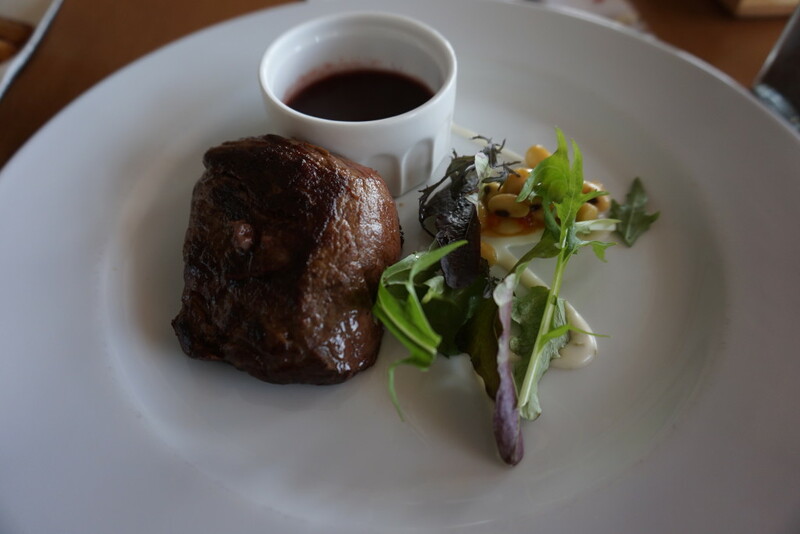 But we can’t forget to talk about our main dish. Hairy Crab! 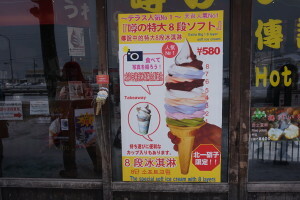 It was sweet. 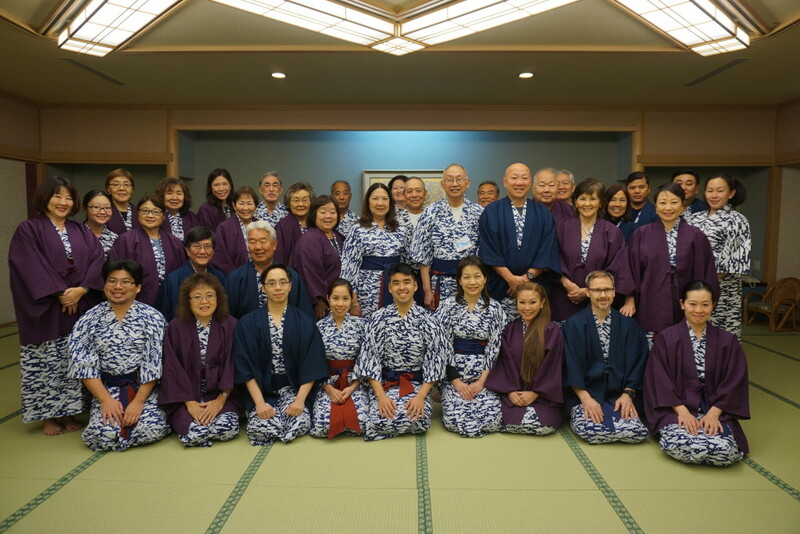 We all wore our yukata to dinner and enjoyed each other’s company. 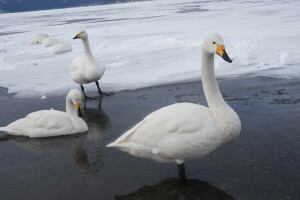 After enjoying great hospitality at our lakeside hotel, Abashiriko So, we headed to Lake Kussharo to look at swans who migrated during the winter. 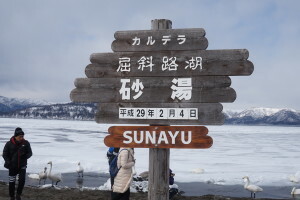 The area called Sunaba has warm water throughout the year because of its geothermal heat so swans come to rest here. They are so gracious, aren’t they? 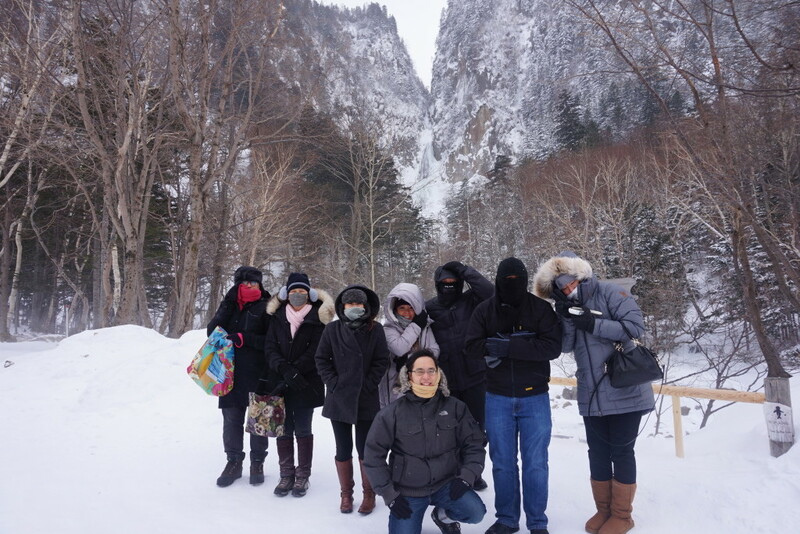 Then, we enjoyed the snowy Mt. Io, including the wonderful smell of sulfur and the view of yellow vent coming out of an active volcano. 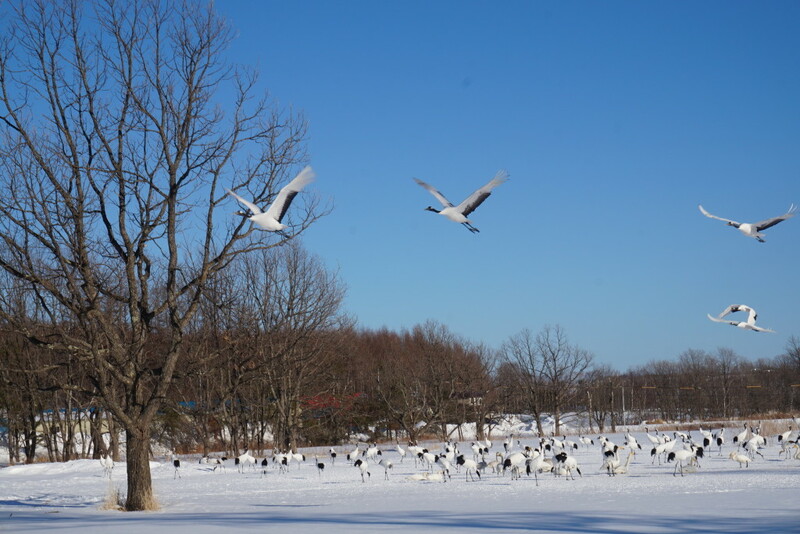 Our highlight of the day was the stop at Tsurui Mura to see the Japanese Red-crowned Crane, a beautiful species of crane thought to be extinct in Japan until discovered in Kushiro Marsh in 1924. 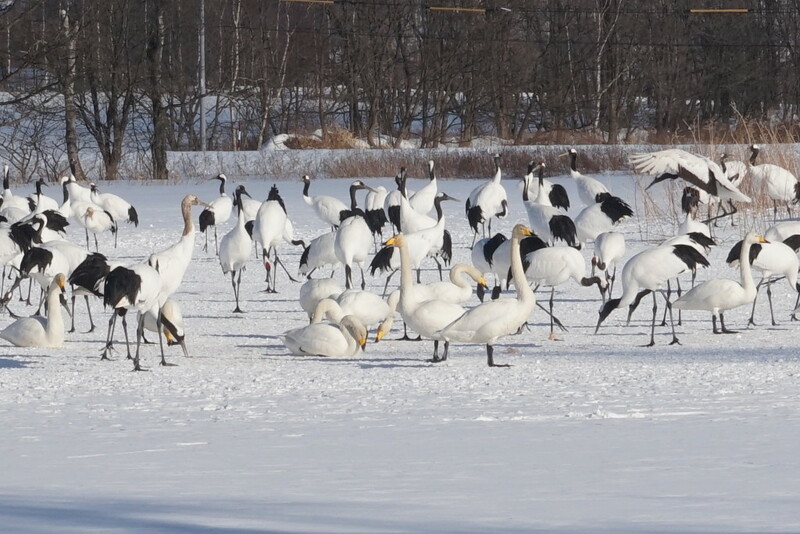 Now there are over 1000 birds, but they only reside in this region of Hokkaido. 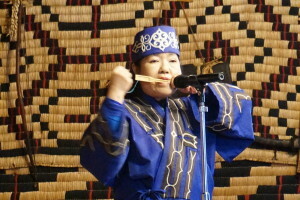 Tome-san feeds the cranes at Tsurumidai Sanctuary everyday so we could watch this beautiful species closely here. The red crest on their head is actually a patch of bare skin. Male and female birds look almost identical but you can tell them apart by the songs they sing to each other. 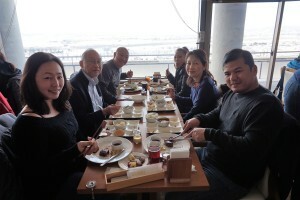 We enjoyed a steak lunch at the restaurant on top of the Ikeda Wine Castle, overlooking the snow covered town. It was interesting to learn about the delicate processes of making high grade sparkling wine. 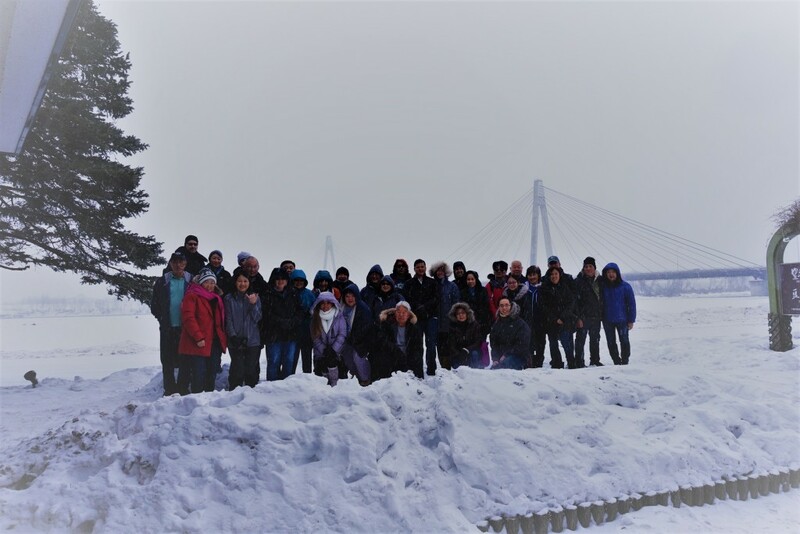 After lunch, we visited the Lake Shikaribetsu Kotan. 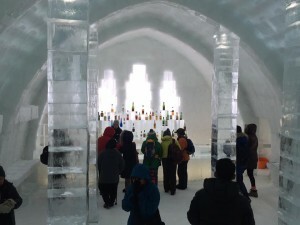 The igloo village has the ice bar, hot spring, hotel, and even a chapel. 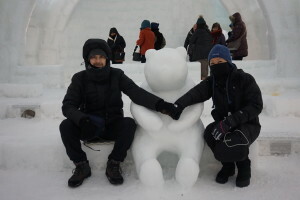 Some of us tried snowmobiling, drinking juice from frozen cups, and taking pictures with the ice polar bear. 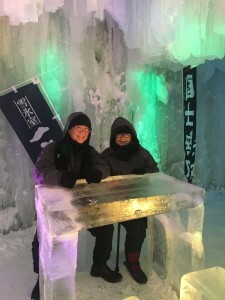 We all had so much fun experiencing the ice world. 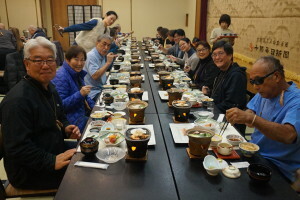 We had another fabulous Japanese Kaiseki style dinner. 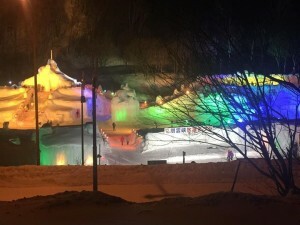 After dinner, we visited the Sairinka Night Festival. 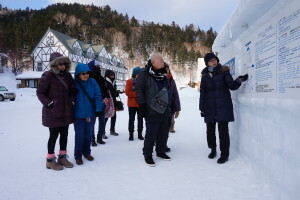 It was a heartwarming snow festival, and their main attraction is a display of lots of hand covered cones made out of special agricultural material. These change color with laser lights collaborated with popular music. It was very unique. 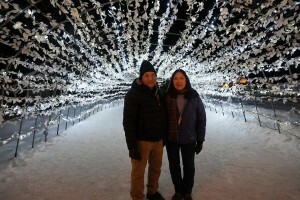 There was also a beautiful light tunnel that we could walk through too. 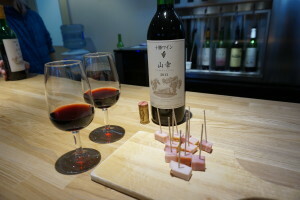 Tokachigawa Daiichi Hotel is famous for its Mole Onsen fascility. 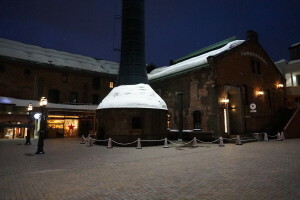 Many of us enjoyed the bath at night and even early in the morning. No wonder we look so nice and shiny today! 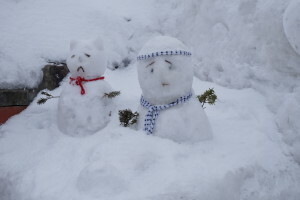 We were heading to Sapporo today. 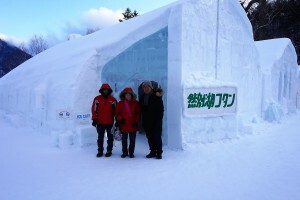 On the way we visited Shiraoi Ainu Village and Lake Shikotsu Ice Festival. 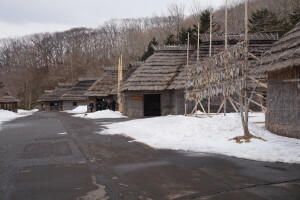 Shiraoi Ainu Village was an eye opening facility which displayed the Ainu’s rich indigenous culture. 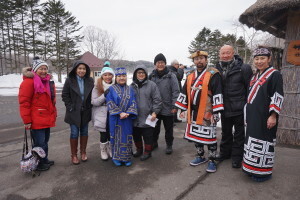 Thank you to Dr. Nakamura, the curator, who took us around the museum as so we could learn much more about their cultural heritage. 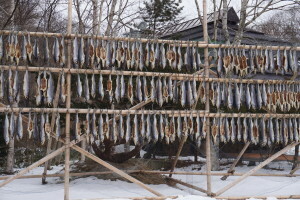 After leaving the village, we ate a late lunch of warm seafood pot at Kani Gotoen. 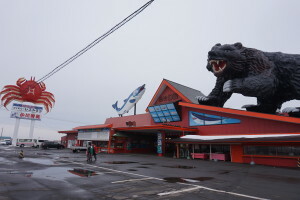 Boy, their statues of bear, crab and salmon sitting on top of the roof were huge! 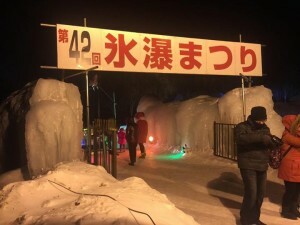 Then we arrived at Lake Shikotsu and enjoyed the beautiful Ice Festival in the late afternoon. 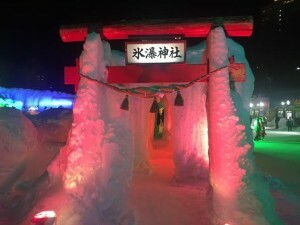 The replica of famous the Blue Lake and the fish museum were some of the highlights of their festival. 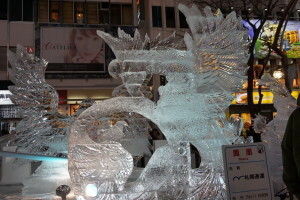 Since it was getting slightly dark outside, all of the ice sculptures with laser lights looked more mysterious, so we enjoyed the beauty of their ice work. 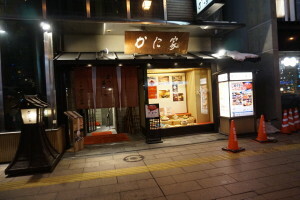 Of course, I won’t forget to mention that we enjoyed warm potato mochi afterwards. It was the best! 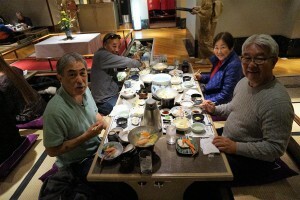 After arriving in Sapporo, our final group dinner was taken place at fancy Kaniya restaurant. 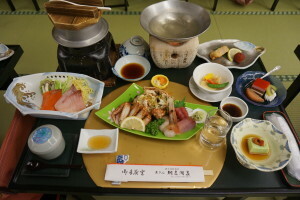 It was a full course of Japanese crab Kaiseki and everything was very delicately prepared. 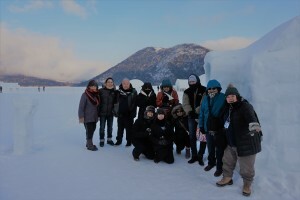 It was such a nice group of people that we travelled with. We all enjoyed talking story at the dinner table. 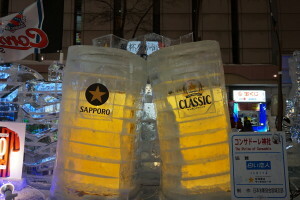 Free day in Sapporo. 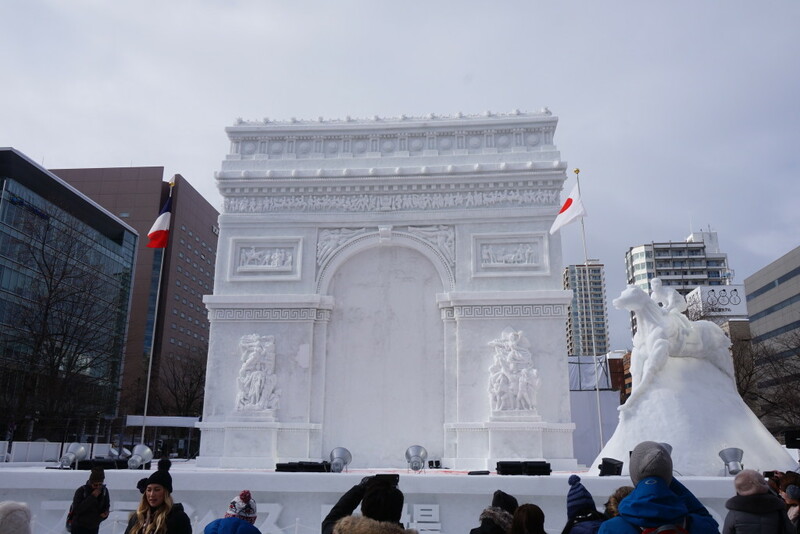 Majority of us walked in the snow to the Sapporo Snow Festival site at Odori Park. 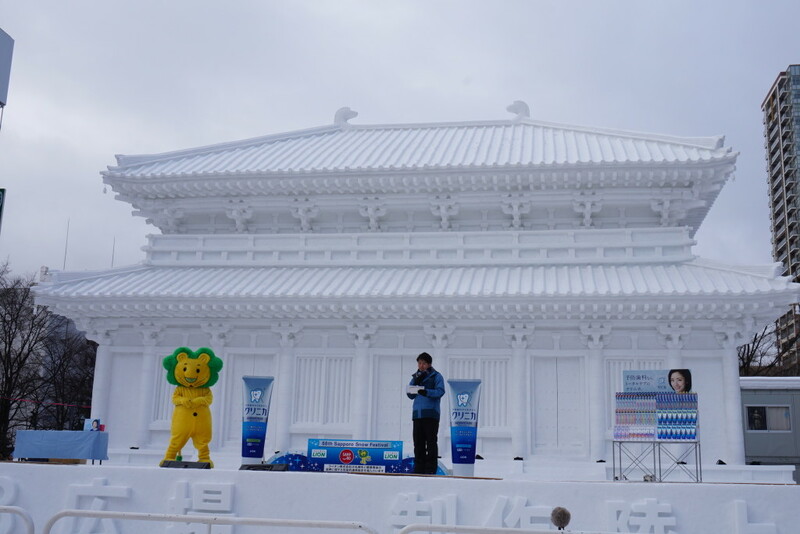 There were giant Anime Characters and replicas of famous buildings from around the world. 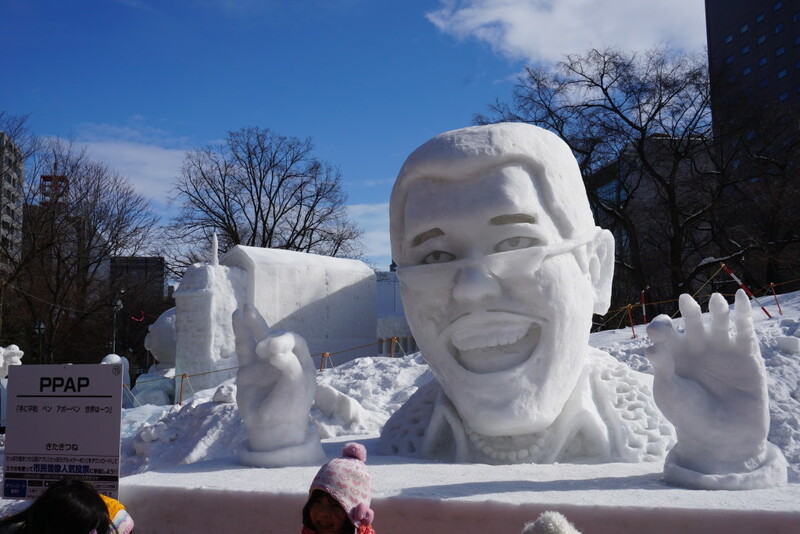 There was even a Pico Taro (PPAP guy) statue, too! 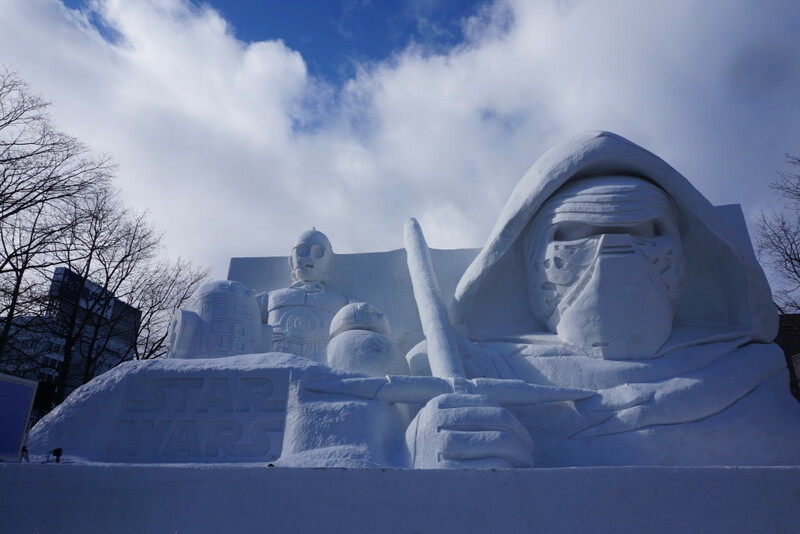 Our guide, Kimi, told us that some of the sculptures are created with the help of a special unit of Japan’s Self Defense Force. 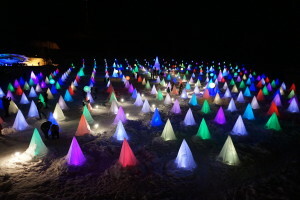 Some of us even came back at night to see the lighted sculptures because they were just amazing! 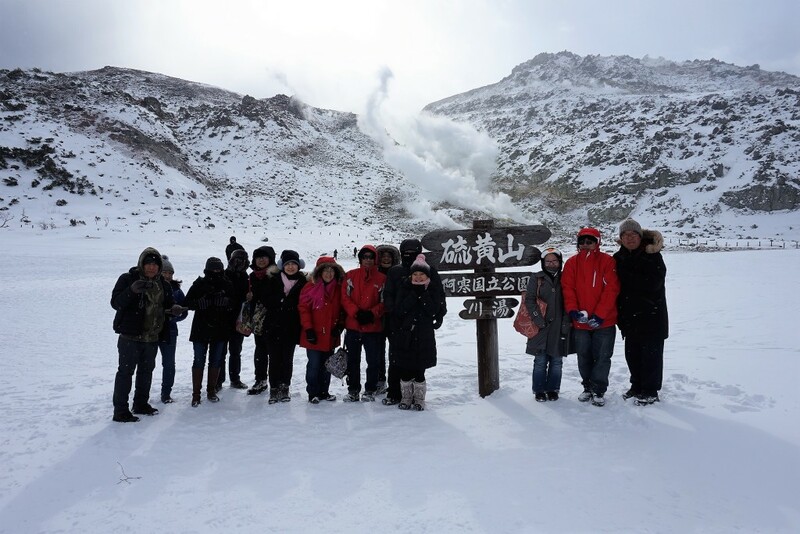 We all spread out to Tanukikoji shopping arcade, Daiso store, Tokyu Hands, Sapporo Factory and so on. 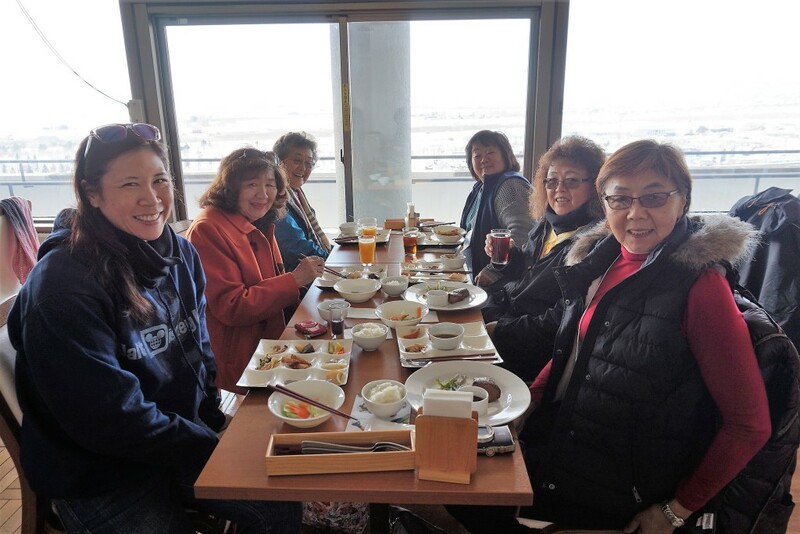 Some of us went to have lunch at Sapporo Outer fish market. The Kaisen-Don, or seafood bowl, was so ono! 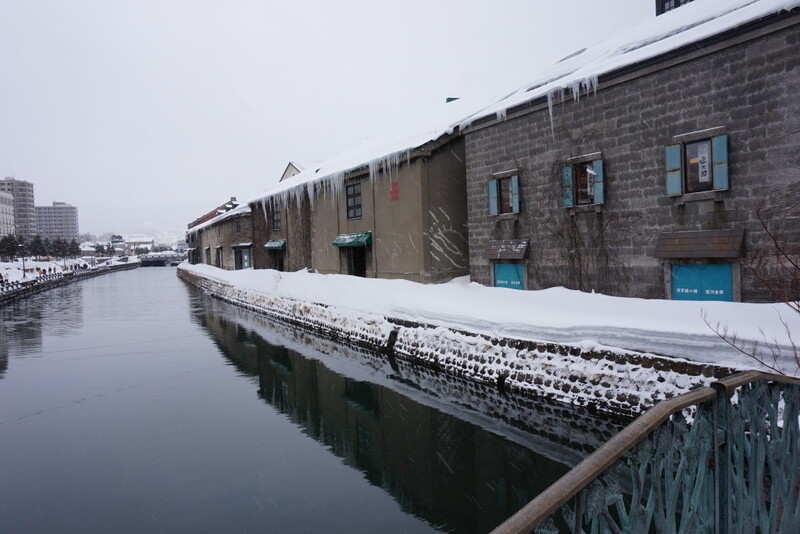 We visited Otaru as our final sightseeing spot on the last day. 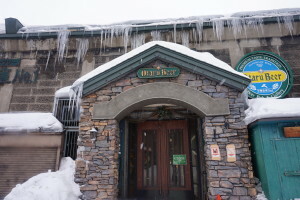 The nostalgic canal was picture perfect covered with snow, and we enjoyed our lunch and strolled down the street. 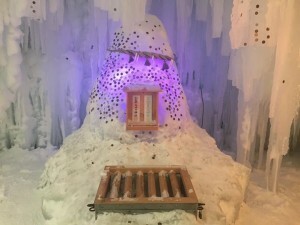 The music box store, Kitaichi glass shop, LeTao’s famous cheesecake, and many more were just some of the attractive shops that were lined up on the popular Sakaimachi Street. 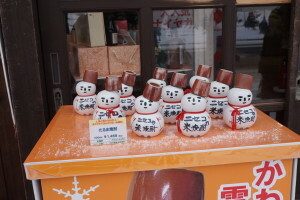 Did you all get the world-famous non-drip soy sauce bottle at Sa Shi Su Se So? Some even change color depending on your lights. 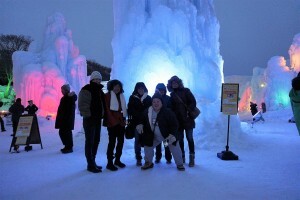 Good times fly quickly, and it was time to say good-bye to Hokkaido. Our flight home was extremely short, less than 7 hours, and we arrived safely at Honolulu Airport. Thank you everyone for being such wonderful tour members. A Hui Hou, till we meet again! JTB is the best place to buy Japan Rail Pass.